Compost retains water in your soil, originally uploaded by Garden for the Environment. After watching the movie Dirt! and reading the Joy of Dirt article in Ode Magazine, I am learning that dirt is as important as air and water. The best thing we can do to reduce landfills and replenish our soil is to compost. Some people have a lot of room while others have limited space. Take a look at some of the photos in the gallery to see what might work for you. 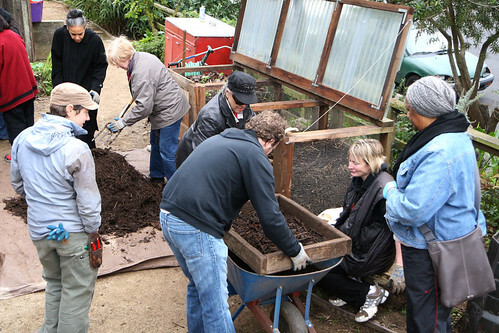 Click here for our flickr gallery of compost photos. Soil is a living system. When we begin to understand what that means we can learn to support the life in the soil thus eliminating our dependence on synthetic pesticides, fungicides, herbicides, or chemical fertilizers. Join GFE andTerry Lyngso (from Lyngso Soil) to learn how you can nourish your soil that will ultimately nourish you! By encouraging organisms in the soil, we get healthy soil and clean water, sequester carbon, and grow beautiful landscapes and food crops that truly nurture us from the inside out! ← Come see us at the Maker Faire!